Senate Republicans released their 142-page draft healthcare bill. It makes deep revisions to the Affordable Care Act, better known as Obamacare, by cutting mandatory purchases, cutting taxes and pulling out of Medicaid expansion. 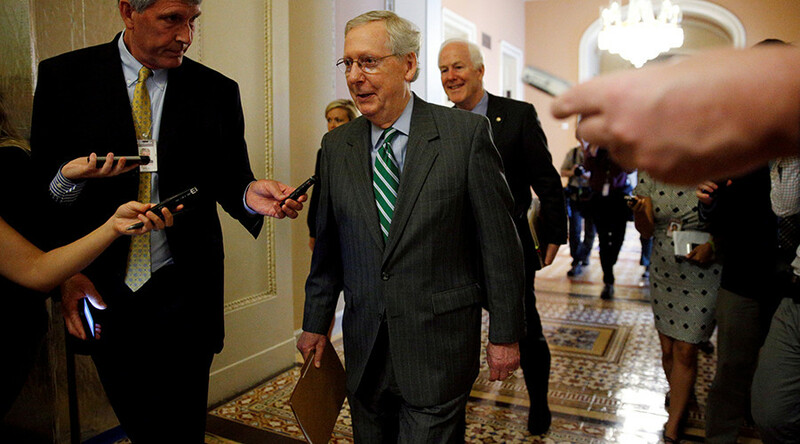 The draft was prepared by Senate Majority Leader Mitch McConnell’s team – largely behind closed doors – and is similar to the Obamacare repeal bill passed last month by House Republicans. The Senate measure, the "Better Care Reconciliation Act of 2017" bill, offers generous premium subsidies for some low-income buyers of insurance compared with the House version. This #Trumpcare bill strips away protections from the ppl who need them most in order to give a tax break to those who need it least. 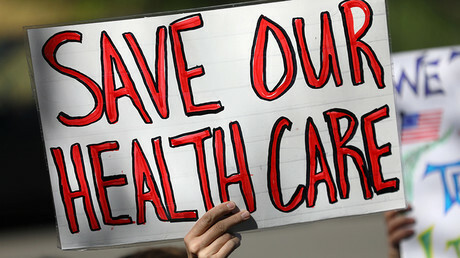 The draft bill, however, cuts federal funding to Medicaid, which will force states to make deep cuts to their healthcare programs for the poor. An expansion of Medicaid benefits currently offered under Obamacare would be phased out beginning in 2020 and shut down completely by 2023, the senators said. The Senate bill restructures the system of subsidies that helped Americans pay for private insurance on the Obamacare marketplaces. About 8 million Americans benefited from lower-priced insurance plans. Under Obamacare, the amount of assistance available was linked to how much people earn and where they live, with larger subsidies for lower-income consumers and residents of regions with very high insurance costs. The House bill linked the credits primarily to consumers’ age, with older Americans receiving bigger subsidies than young consumers. Senate Republicans are keeping the income-based structure, while dialing back aid for middle-income consumers. McConnell, the senior senator from Kentucky, is hoping for a vote on the measure through the Senate next week. There is opposition to the bill from half a dozen Republicans and push back from Democrats. "It's every bit as bad as the House bill, in some ways even worse" said Senate Minority Leader Chuck Schumer (D-New York). "The president said the House bill is 'mean'; the Senate bill may be meaner. It may be a wolf in sheep's clothing, only in this bill, the wolf's teeth are sharper." Under the draft bill, tax increases imposed on higher-income people and medical industry companies would be repealed. Under Obamacare, those two groups help pay for expanded coverage. The bill does away with tax penalties for those who don’t buy health insurance under the Affordable Care Act. “We will see what the working [Senate] draft does to job losses," she added. Pelosi said the draft still has to be scored by the Congressional Budget Office (CBO). The GOP proposal would provide an additional $50 billion over four years to stabilize insurance exchanges, according to Bloomberg. Under the plan, $15 billion a year would be used to market-stabilize funds over the next two years and $10 billion a year in 2020 and 2021. These payments would come in addition to cost-sharing subsidy payments, which would be extended through 2019. The bill will “ultimately transition away from Obamacare’s collapsing system entirely, so more Americans won’t be hurt,” McConnell said Thursday on the Senate floor. The draft bill would provide $62 billion over eight years to a state innovation fund, to be used for coverage for high-risk patients, reinsurance and other items. The proposal retains Obamacare’s subsidy formula, but makes the aid less generous. Subsidies would be cut off for individuals making 350 percent of the poverty level, rather than the 400 percent limit under Obamacare. Speaking from the Senate floor, Senator Ron Wyden (D-Oregon) said he found the secretive process over the bill’s drafting bizarre, especially because it occurred without a single hearing. He said that was in contrast to the process that led up to the Affordable Care Act. “It is real clear what is going on here," said Wyden. "Senate Republicans are going to keep telling Americans they are fixing their healthcare bill right up to the second they are taking it way." The proposal also caps federal spending on the Medicaid program for the poor – based on a broad measure of inflation, rather than just medical inflation – beginning in 2025.